site was true in the 3-yr and 4-yr crop rotations. cluding hybrid canola in the rotation. above average in 1999 and 2007, and very wet in 2005.
turned to each corresponding plot/treatment. diameter) from the 0 - 7.5, 7.5 - 15 and 15 - 20 cm layers. tored for pH in 0.01 M CaCl2 solution with a pH meter. Table 1. 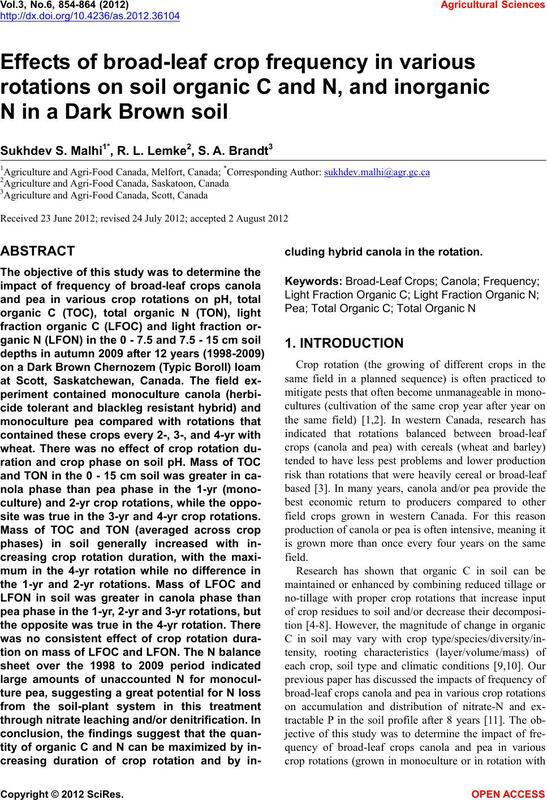 Description of crop rotations in a field experiment from 1998 to 2009 at Scott Saskatchewan. were calculated using the linear (REG) procedure. pected to be a serious problem in this soil site. 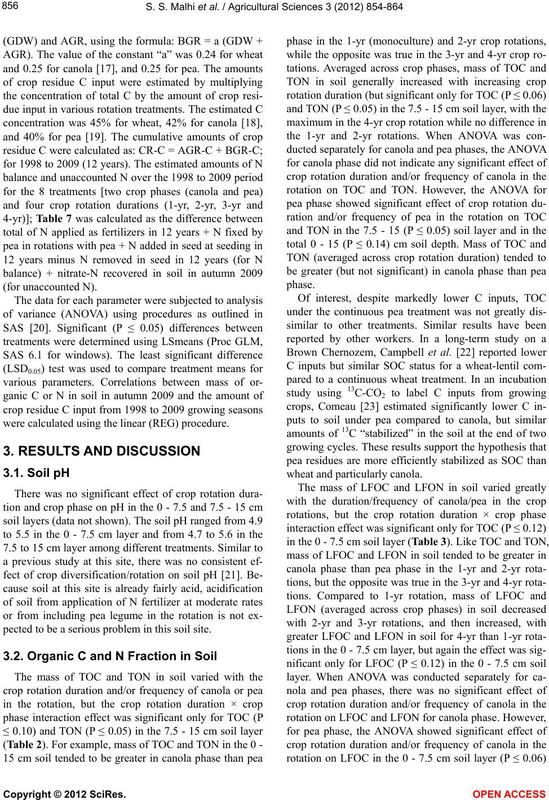 organic N (TON) in soil in autumn 2009 at Scott, Saskatchewan, Canada. , * and ns refer to significant treatment effects in ANOVA at P ≤ 0.1, P ≤ 0.05 and not significant, respectively. 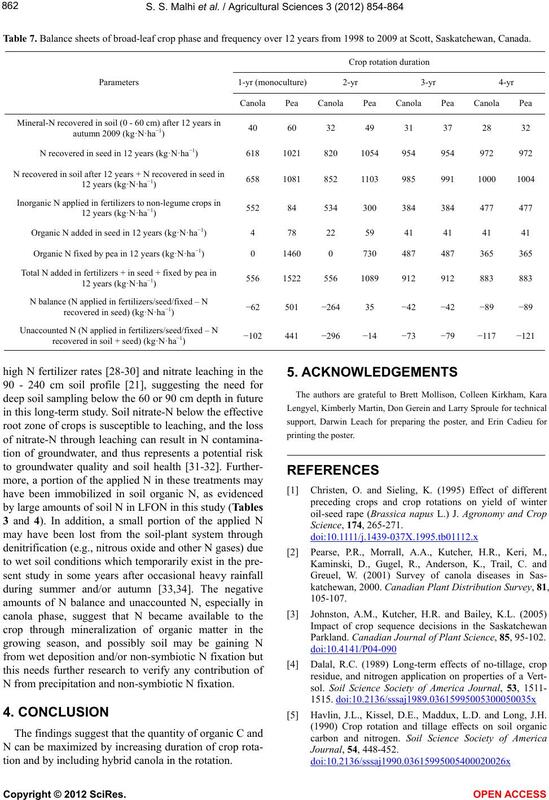 and light fraction organic N (LFON) in soil in autumn 2009 at Scott, Saskatchewan, Canada. * and ns refer to significant treatment effects in ANOVA at P ≤ 0.1, P ≤ 0.05 and not significant, respectively. phase than pea phase in most cases. TOC and TON (Table 5). tion with two wheat crops. soil sampled in autumn 2009 at Scott, Saskatchewan, Canada. , *, *** and ns refer to significant treatment effects in ANOVA at P ≤ 0.1, P ≤ 0.05, P ≤ 0.001 and not significant, respectively. 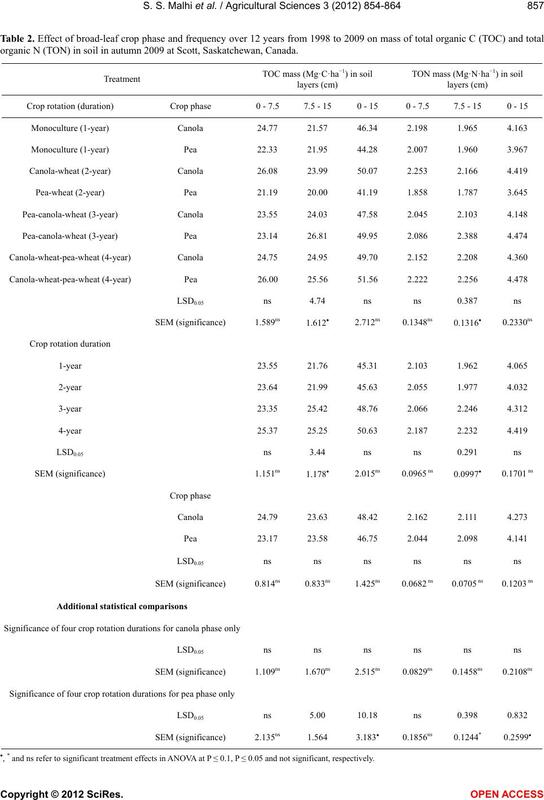 ns refer to significant treatment effects in ANOVA at P ≤ 0.05 and not significant, respectively. in a few cases even after 12 years. 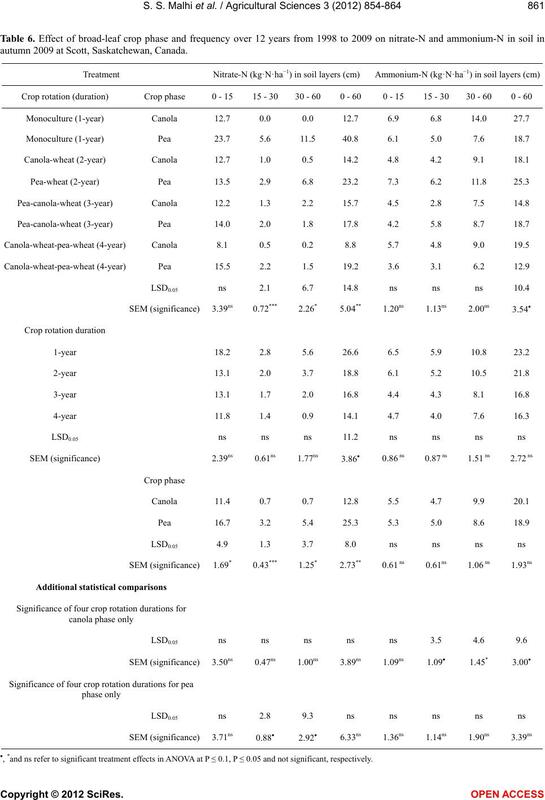 crop rotations were not significant. 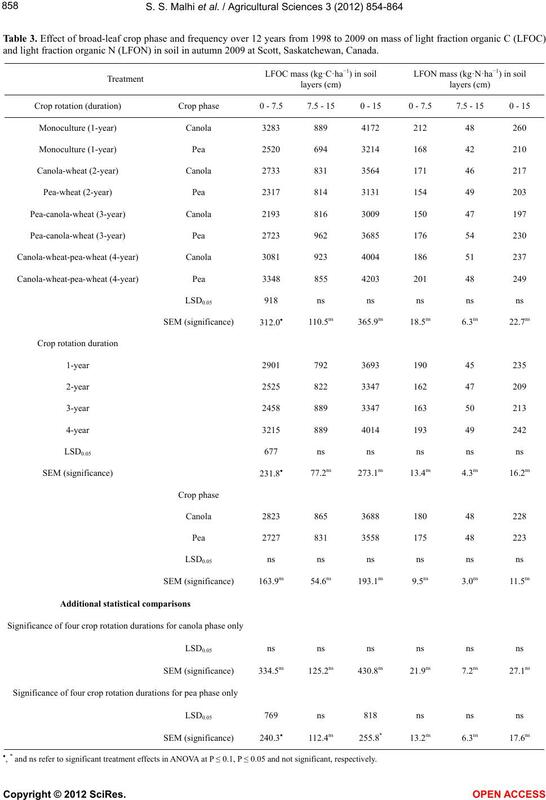 frequency of canola in the rotation on soil nitrate-N.
rotations with high diversity of annual grain crops . can be decreased with efficient cropping systems . not be accounted for ranged from 441 to −296 kg·N·ha−1. autumn 2009 at Scott, Saskatchewan, Canada. , *and ns refer to significant treatment effects in ANOVA at P ≤ 0.1, P ≤ 0.05 and not significant, respectively. Table 7. Balance sheets of broad-leaf crop phase and frequency over 12 years from 1998 to 2009 at Scott, Saskatchewan, Canada. 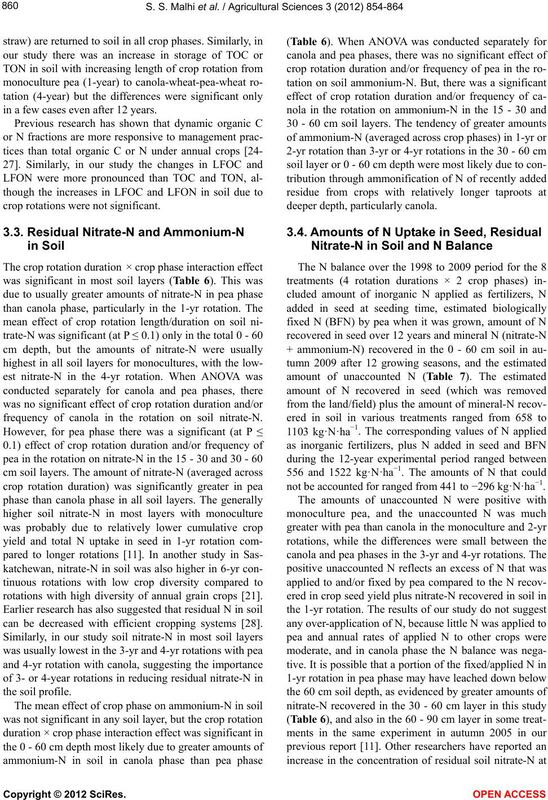 N from precipitation and non-symbiotic N fixation. tion and by including hybrid canola in the rotation. Parkland. 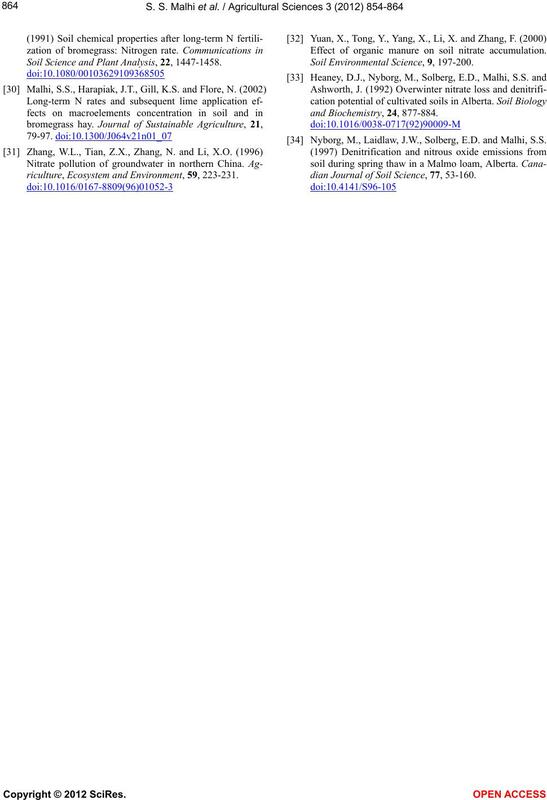 Canadian Journal of Plant Science, 85, 95-102. Havlin, J.L., Kissel, D.E., Maddux, L.D. and Long, J.H. ety of America Journal, 56, 1799-1806. 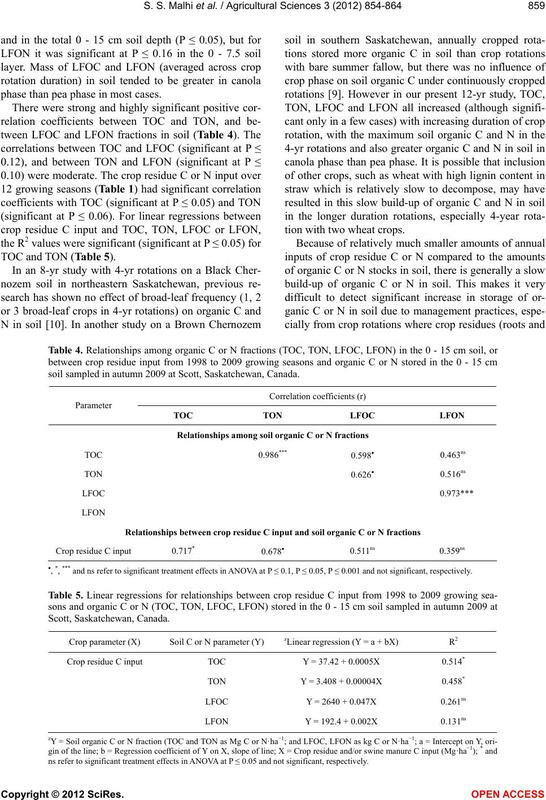 Campbell, C.A., Moulin, A., Lafond, G.P., Brandt, S.A.
nadian prairie soils. 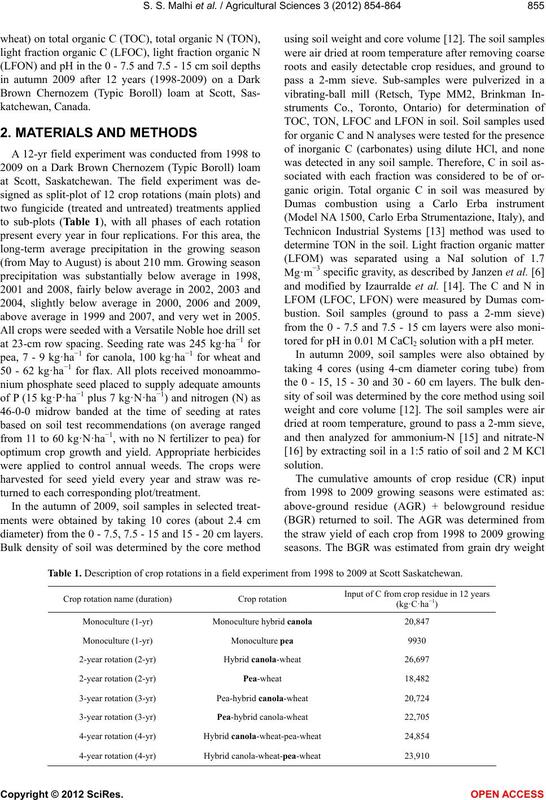 Soil and Tillage Research, 74, 81-90.
years in a Dark Brown Chernozem in Saskatchewan. for Global Environment Strategies, Hayama. SAS Institute, Inc. (2004) SAS product documentation. Version 8, SAS Institute, Cary. soil. Nutrient Cycling in Agroecosystems. Malhi, S.S., Harapiak, J.T., Nyborg, M. and Flore, N.A. Soil Science and Plant Analysis, 22, 1447-1458. 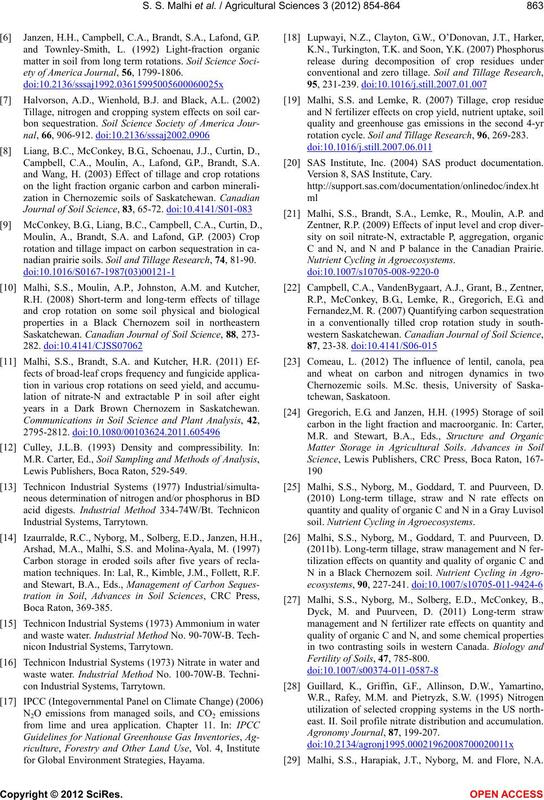 Soil Environmental Science, 9, 197-200.